By taking shortcuts, I have missed out on the fun traditions and stunning sorority sisters at CU. I believe that in taking shortcuts I miss out on more in life. Shortcuts are everywhere and most of the time I feel like they are the best alternative. However, I have come to realize that this statement is completely false. Many times I have found that in the moment a shortcut might sounds like the best idea, but later on I have learned that by taking the shortcut I am only hurting myself. At the beginning of my freshman year at CU, I attended an enormous ceremony at Folsom Field. As I sat in the stadium bleachers, sweat dripped down my face from the heat of the blazing sun. A wave of Shoulder-to-Shoulder t-shirts covered the stands like a sea of gold. 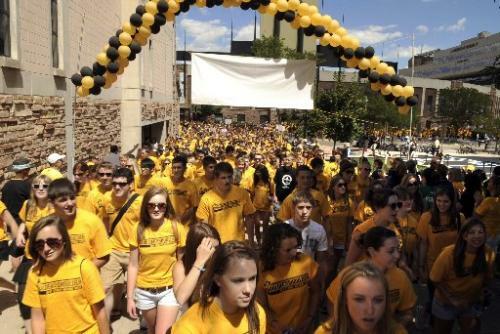 After the ceremony was over the entire incoming freshman class simultaneously stormed to the top of the stadium and headed towards Farrand Field. When I got to the top I was caught in what seemed to be a swarm of yellow jackets. I felt like I was at a concert in a mosh pit of fresh meat. By the time I got to the top everyone was filing together like a heard of buffaloes. My friend and I stood toward the end for ten minutes and noticed that the line was not moving anywhere. I decided it would be a good idea if we walked around a few buildings then jumped in the line in front of Libby Hall. The shortcut had worked and we got to the ice-cold El Dorado Natural Spring waters much faster. The only thing was that I missed a very important part of the line. By skipping the line, I missed the sight of the wind blowing through the black and gold balloon arches and the hairs of the sorority sisters as they sang their house song, jumping up and down, and clapping their hands. I realized the fifteen minutes I saved by taking the shortcut was not worth it. This event has been said to grant good luck to students in their college careers. As a freshman I want and need all the good luck I can receive. The next time I am waiting in line for something and feel like I know a faster way, I am going to ignore that feeling and take the long path with everyone else. With the many shortcuts, it is tempting to take them. However by taking the shortcut you are exempting yourself from all the experiences life has to offer. Taking life one step at a time and waiting your turn in line is the only way for us to experience all of life’s opportunities. I now know that shortcuts are everywhere and taking the easy way out might sound good at the time, but by taking control of my choices I can ensure that I live life to the fullest and fulfill my destiny.